Goûtez at a Taste of City Fresh at the Chicago French Market, "where seven Chicago vendors will offer a sampling of their best items!" Admission FREE. Blast off—but nothing literally, please—on Independence Day! Remember the Green City Market will be closed for the holiday, but tickets are still currently available for the GCM Chef&apos;s BBQ July 12! Admission $100. Celebrate the Kateri Tekakwitha Feast Day and the monthly Indian Taco Friday at the Kateri Center of Chicago. Kateri Tekakwitha "is the first Native American woman to be venerated in the Roman Catholic Church." 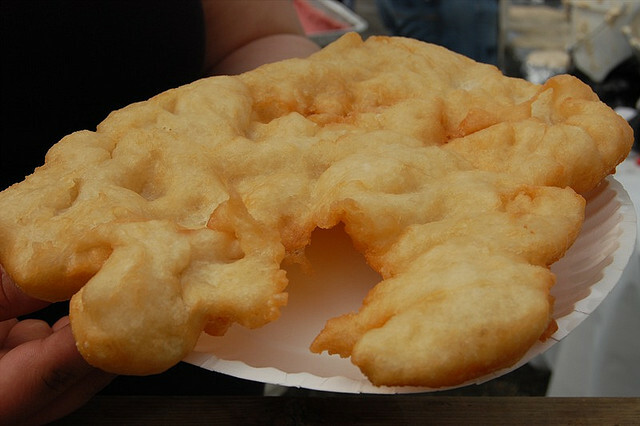 Beef and veggie tacos, plus blanket dogs—all wrapped in golden, puffy, fry-bread—will be available. The Center, "a ministry of the Archdiocese of Chicago serving a community of American Indian Catholics through faith formation and Native traditional prayer." Admission to the feast day luncheon FREE; tacos available for purchase. Mingle at the opening reception of Cheating Hearts at Firecat Projects, with "[n]ew artwork by multi-talented Jon Langford. He will performing music during the evening in the adjoining courtyard of our neighbor&apos;s Red Door." There will be Three Floyds beer. "Founded by [artist and gourmande] Tony Fitzpatrick and Stan Klein, Firecat projects gives artists control over their own careers by offering each artist a solo exhibition and taking no percentage of sales from any artist." Admission FREE, food and drink available for purchase at Red Door. "Watch how to properly butcher a pig and learn about what to do with the different cuts" at a pig butchering demo at The Butcher & Larder. "Attendees can purchase cuts at 10 percent off retail." Follow B&L closely on Twitter for extremely limited edition specials, like holiday sausages and mini chocolate cream pies! Admission $50.